Apples are fun for fall and all, but we’ve been missing pineapple. 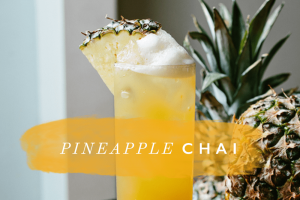 This tart but tropical juice makes for the perfect afternoon Pineapple Chai treat. Enjoy the indulgent taste of a cocktail without the alcohol. If you’re feeling adventurous, liven things up by adding an ounce of rum! Add chai concentrate and pineapple juice to a glass with ice. Stir to combine. Garnish with fresh pineapple wedge. How’s that for a totally new chai expression? Have you made any new chai recipes lately? Let us know in a comment below!